Nice! Honestly, I'm loving it. The characters - I suppose they are Elves - look special, each in their own way. Well done! 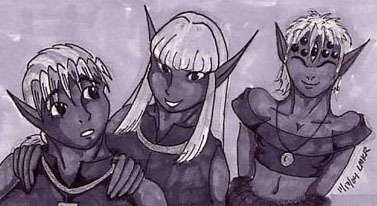 Yeah, they're Drow or Dark Elves, so that's why they look like elves Angel, they're related (but don't tell them that or they'll kill you. They don't like being reminded of that :wink: ). That was YOUR choice of names? My bad. :cry: Sorry Goddess. But I can't help but cringe... makes me think of the Teletubby. :wink: And that vision sends a shiver down my spine. Toss a "z" or an "x" somewhere in the mix and I'm golden. De'zala or De'laxa. Now that sound's more Drowish.